'Tuck Everlasting' Asks: If You Could Live Forever, Would You? 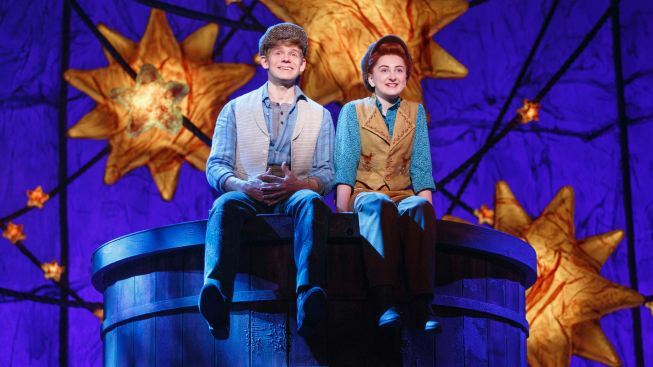 Andrew Keenan-Bolger and Sarah Charles Lewis are on top of the world in "Tuck Everlasting." Below, Terrence Mann as the villainous carnival barker. Newcomer Sarah Charles Lewis, 11, reprises her role as Winnie Foster, originated last year in an Atlanta tryout. Winnie, the heroine of Natalie Babbitt’s 1975 story, is a swell role model for girls, a courageous child only reined in by her recently widowed and, thus, overprotective mother. When a confrontation between mother and daughter leads Winnie to run off into the forest, she meets Jesse Tuck (Andrew Keenan-Bolger, of “Newsies”), the youngest of an otherwise-relatable family with an unusual secret: years ago, the Tucks drank from a spring in these woods, and the water made them all immortal. Is that a good thing? Not to hear the Tucks tell it. Parents Angus and Mae, and their sons—Jesse has a sullen older brother, Miles—must live for years separated from one another, to avoid arousing the suspicion of locals who might wonder: Why don’t these people ever age? The new musical, adapted by Claudia Shear (“Dirty Blonde”) and Tim Federle (the performer-turned-author of novels such as “Better Nate Than Ever”), has fun with the lengths Winnie and Jesse are willing to go to satisfy their sense of adventure. Their stomping ground is Treegap, a New Hampshire village fancifully imagined with rainbow-hued carnival grounds and an abstract tree resembling ribbons of fettuccini noodles. There, Winnie and Jesse encounter “the man in the yellow suit” (Terrence Mann, up to his usual exacting standards), the villain who serves as a catalyst for the simple plot. Keenan-Bolger, the energetic performer with his hands in any multitude of entertainment projects (also co-author of the youth-oriented “Jack & Louisa” books), is charismatic as a figure with the impulses of a 17-year-old, who is nonetheless over 100 years old. “Tuck Everlasting” is a real showcase for his whiz-bang dancing skills. Carolee Carmello and Michael Park are welcome as the TV sitcom-like Tuck parents, tasked with explaining facts of life to Winnie … who is convinced immortality is desirable. Robert Lenzi stands out as Jesse’s older brother, whose wife fled with their young son after unraveling the Tuck mystery. Fred Applegate, Michael Wartella, Valerie Wright and Pippa Pearthree offer nice performances in supporting roles. A tone of melancholy underscores “Tuck Everlasting,” as Winnie and Jesse try to escape the pressures of their lives. Among the more memorable songs (music is by Chris Miller and Nathan Tysen) is “Top of the World,” which has the duo scampering up that surreal tree, briefly abandoning their cares before making fateful decisions. A gorgeous silent ballet, depicting the passage of time, doesn’t integrate well with the story beforehand. “Tuck Everlasting,” at the Broadhurst Theatre, 235 W. 44th St. Tickets: $59-$147, on sale through Jan. 1, 2017. Call 212-239-6200.